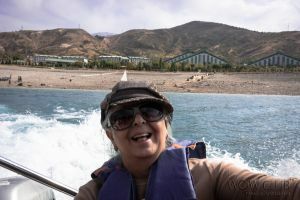 The exotic, romantic history of Tamerlane, the silk route cities of Samarkand and Bukhara is what drew me to Uzbekistan, a cradle of ancient culture juxtaposed by modernization. A safe and friendly country with people that are happy to be photographed & chat despite the language barrier. A predominantly Muslim country there is no muezzine call for prayer from the mosques. The devout pray on their own. Religion is a personal matter, a remanent of Russian socialism. The Uzbeks love to party. The entire family is happy to do a night out together. From grandparents to 5-6 year old grandchildren are part of this dinner, dancing, belly dancing floor show. Couples of all ages dance, some quite skilfully. The kids too. The little girls & boys carry tips from their families for the belly dancers, all open and unabashed and yet the male members sit at a different table from the female. Another night, we were part of a dinner & fashion show in a dream setting in a courtyard of a lit heritage building surrounded by outlets of handicrafts & boutiques. One of the boutiques showcased their ensembles. It’s pretty much an open society, not very affluent but fun loving. The cities, specially Tashkent, are very European looking with wide tree lined boulevards, modern buildings, designer stores & malls. 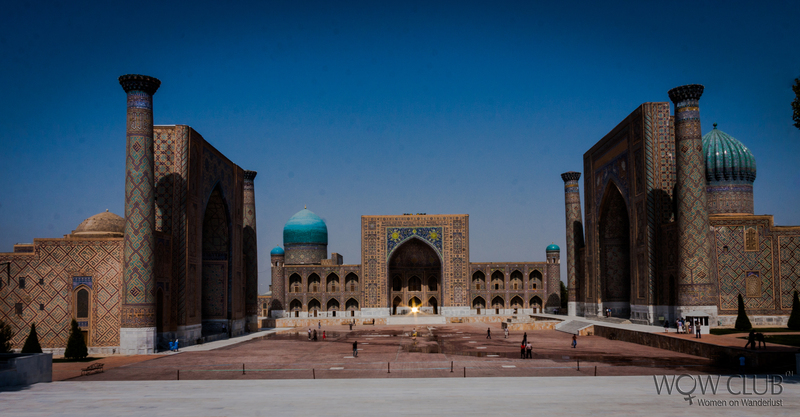 But a little away from this is the real Uzbekistan. Street markets with vendors selling dry fruits, vegetables, local munchies, breads, household goods, clothes, carpets…..just buzzing with activity. Alcohol like music has a universal language, but food belongs to each country. Uzbekistan offers a large variety of dishes, but not a country for vegetarians. Mutton, chicken, pork, beef are added to stews, palavs or served roasted or as kebabs, though the picture pretty much displays the vegetarian fare. Unless you are an extremely adventurous non-vegetarian stick to ordering roast chicken with potato wedges & fried tomatoes if you can’t find an English speaking person to translate your order, followed by baklava or millefeuille for desert—yummylicious! **Raajika** was born with an incurable travel bug and loves travelling of any kind from a simple day trip to trekking, living in tents or at the fanciest of hotels. She has wandered with WOW to Uzbekistan, France, Portugal, Bavaria, South Africa, Tanzania and more and looks forward to wandering some more! Raajika is fascinated with new ways of communication. Digital photography and all that it entails has opened up an area of unlimited pleasure. She likes playing golf, bridge and of course wandering through the world.